Battery Backup Power, Inc. UPS Successfully Completes Backup Test At Utility Company With Critical Infrastructure Designation – Battery Backup Power, Inc.
On July 20th, 2015, a Battery Backup Power, Inc. uninterruptible power supply (UPS) successfully completed a backup test at a utility company classified as “Critical Infrastructure” by the Department of Homeland Security. The Battery Backup Power, Inc. units supplied uninterrupted pure sine wave power for over the 15 minute requirement to all critical devices including low wattage servers, networking equipment, POE VOIP phones, and other equipment. In this instance, only 15 minutes was required as a backup generator would typically be used after that period to supply power in prolonged outage situations. Even after 15 minutes, the uninterruptible power supply systems still had over 50% battery life remaining. This is due to the business practices of Battery Backup Power, Inc. The company usually builds in extra capacity for every job to ensure it’s clients have the expected backup time needed when they need it most. 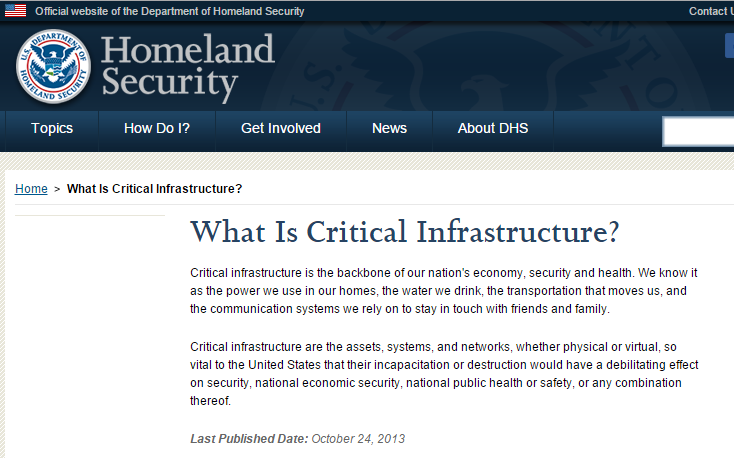 Below is an excerpt from the U.S. Department of Homeland Security’s website on “Critical Infrastructure”. “Critical infrastructure is the backbone of our nation’s economy, security and health. We know it as the power we use in our homes, the water we drink, the transportation that moves us, and the communication systems we rely on to stay in touch with friends and family.